Treasures’ sums it up well. Intriguing clusters of objects become treasures in this exhibition curated by PHA member Dr Birgit Heilmann and team of the Hurstville City Museum and Gallery. The objects introduce the visitor to Hurstville locals of several generations. They also explain how the locals’ involvement in business, leisure and home life was linked in radiating circles to greater Sydney and to a broader middle-class cultural life tied to the United Kingdom, the church and European fashion. Hurstville has seen a strong Chinese community grow across the past few decades. While this exhibition did not extend to their presence in the suburb, it was interesting to see several Chinese and bilingual entries in the visitors’ book. Sincerity emanates from the locally handmade objects, such as the models of historic buildings made by a Hurstville resident concerned for their protection after the demolition of Sydney’s Old Blue Bell Inn in the 1930s. And once you’ve noticed them, there are local hands everywhere – clasping handbags, turning gramophone handles, administering pinches of smelling salts. Objects like the ingenious raffle ticket receptacle (a toothy, jug-eared gentleman wearing a pair of novelty spectacles with plastic nose and moustache attached – you deposit your ticket in his mouth) glued together by an enthusiastic local bowling club member don’t come across as kitsch here, but instead as expressions of a bustling community life. Another thread in the exhibition is collecting. Visitors engage with questions like, why collect buttons? How do you keep cakes in a museum? 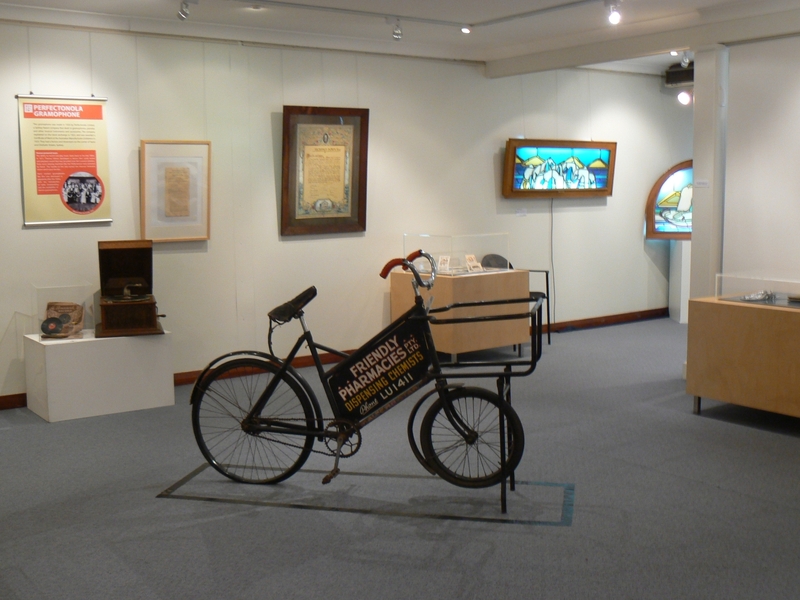 How did the Hurstville Museum collection begin? The program of talks and workshops associated with the exhibition played further on this theme, including a time-capsule workshop for teenagers and adults, and a talk by Michael Lea, curator at the Powerhouse Museum on the acquisition of Lieutenant Clements’specimen cabinets, the fruit of his enthusiastic collecting on a series of sea voyages from the 1820s to 1840s. I had a chance to meet Birgit briefly, and when she mentioned having worked in Hahndorf a few years ago, I found myself saying ‘Ah well, Hurstville’s a bit different’. I don’t know anything at all about Hahndorf – except that it’s picturesque — and realised I was expressing a Hurstville cringe (I work here) to the curator of the Hurstville Museum and Gallery! As I left the exhibition, and walked back past the Friendship Pharmacy and Miles Franklin’s statue, the cringe had lifted and I looked about me with more curiosity than usual. Interesting blog and a very worthwhile presentation. Thought bubble….. As a former teacher I would loved to have been able to host a sort of ‘history in a box’ presentation. By that I mean packing history oddities and gee-gaws into a large box + posters + maps + whatever and then open up to students on a particular topic. The reason why I mention this is two-fold. There is a shortage of decent visiting ‘history’ presentations made to schools (probably little money in it). Also, in visiting museums and galleries I tend to find my eyes glazing over so that the experience becomes somewhat trance-like. What am I driving at? I think it’s about making history come alive, which is a perennial issue for museum curators. I don’t have a ready solution. I enjoyed the exhibition. I thought it had some unexpected items such as the Blue Bell Inn model by Daniel John Aldous of Penshurst which was made from the actual bricks of the original inn plus the roof made from a tile from the Commissariat Store. I liked the use of the ipad to give more information about some items. My favourite item was the raffle box from the Beverly Hills Bowling Club with the face on it. I also liked the George’s River Motor Ferry Company advertisement (c1900s) for the Parksvale Pleasure Grounds with a Dancing Pavillion and a Razzle Dazzle (1s return or 6d for children). I’ve done a bit of research on the Bown family due to a link with the early fire brigades of the area (Charles Bown was on the Fire Brigades Board). I was pleased to see Archibald Bown (Aldmerman on Hurstville Council, 1911-1922) recognised in an illuminated address by the Hurstville & District United Friendly Societies Dispensary, Nov 1926. It is quite appropriate as their building is just across the road from the museum. I also liked the medicines on display including castor oil, throat spray, Watkins petro-carbo salve, Tri Test Epsom salts pure, Beechams cough pills, smelling salts and Throaties. I think some of the nurses in the photo above the display may even have visited my grandmother who lived in Hurstville back then!